You must protect you and your business from a liability standpoint. Well, we call it a divorce because it can be that painful, especially when unplanned. If you are in a business partnership, or have a working relationship with anyone, such as customers, employees, contractors or others; you need to be prepared. The divorce in all these instances can be made better with some preparation and understanding. 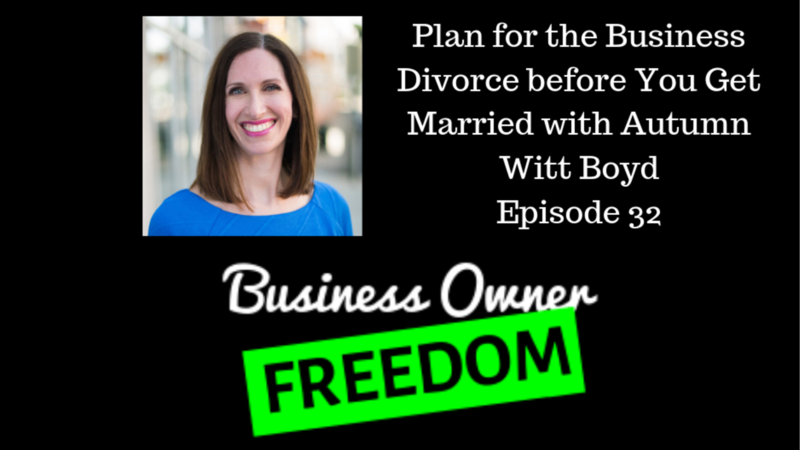 So yes, you can and will have divorces in your business journey. Holy Cow!, as Harry Carey made famous, we see Business Owners without basic contracts every day. If you are that business owner, take warning, you are in jeopardy of finding out the true meaning of liability. 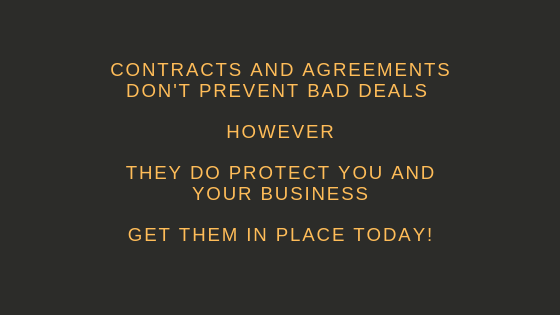 Seriously, you need to stop and think through what you are risking by not having some simple agreements and contracts in place for your business. Without them you are leaving the door wide open for an expensive educational experience. Find an expert attorney and get them done. You will find a couple of resource ideas in the podcast from Autumn Witt Boyd. Listen in and take note. You can reach Autumn and her team here. You must have the proper entity for your business. There are tax and liability implications that correspond to having the best entity for your business. I learned the hard way, early in my entrepreneurial journey, that the advice I had been given to use a C Corp for my business was costing me money and time. It was a pain all the way around and it wasn't serving me or my business. We utilize an LLC now and it does exactly what we need for our business. Listen to Autumn explain the thoughts that go into choosing and entity. One area that is misunderstood greatly is the employee vs. independent contractor status of those who work for your business. As a business owner you can get into serious tax and legal jeopardy by not classifying those who work for you correctly. Some business owners even choose to classify incorrectly hoping they will not get caught. The premise is that an independent contractor status saves a tax burden. You had better be sure that you are legally correct, because it can come back to be a big mistake, if not done within the proper state and federal laws. Consult an attorney in your area today if you are concerned about this. A business owner must build and maintain relationships with several experts for your business to succeed. We recommend, at a minimum, that you have an attorney, a CPA, a tax expert and a business advisor that you can count on as needed. These need to be people you speak with on a regular basis and have a working relationship with. You cannot wait until a crisis happens to build this team. You must be able to respond quickly and sufficiently to the problems that arise. The other important thing to consider are what agreements you need in place. Where do you touch clients, employees and/or contractors with an exchange of funds? Where ever money is exchanged or agreements are made on a regular basis, a contract or legal agreement needs to be constructed and executed. Make a list right now of the places where you know this is lacking. Also, consult your attorney for advice on all legal documents you need, such as privacy, terms and conditions, non-competes, NDA,s, and others. They will know best what your particular business needs to be protected and efficient. The third idea to consider is to go to the AWB Firm website and use templates for some of the most common agreements and contracts to get you started inexpensively. Get something in place today, even if it is not perfect. Once those are in place, you can go back and review them with an attorney in your area to dial in the specifics as you learn what your business needs. Take action. In this episode, you will hear Autumn and I laugh at the way we use disclaimers all the time to make sure everyone knows we only give information on our podcasts and in blog posts...etc. Even though we said this with humor, we really mean it. This podcast and this blog post is just information. You need to get advice from your attorney as we are not giving legal advice or any professional advice within a client relationship. We are just providing information for you as we could not possibly know your unique circumstances and needs. Use this information at your own risk :). See how we did that? We can make legal proclamations and yet still have fun, be joyful and enjoy what we do. Don't think taking legal steps for your business has to be dry, dull and boring. Sure, sometimes it is, but hey, Autumn makes it fun and interesting for me. Find you a smart, competent attorney that also has fun. Another resource that I have used is the book, Start Your Own Corporation by Garrett Sutton from the Rich Dad Poor Dad series. It does a great job of of taking you through some legal discussions and how to reduce your liability. Use it as a guide to speak with your attorney on how to get things set up right. If you enjoyed this podcast, please subscribe to our podcast on your favorite player so you don't miss and episode. Also, leave us a rating, if you will, on iTunes. We truly want to help as many business owners as possible, so spread the word! We would also love to have you join one of our Business Owner Freedom Mastermind groups. You can check them out here - Business Owner Freedom Mastermind.